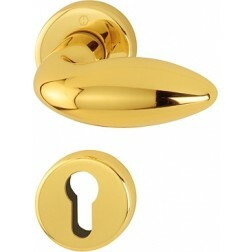 Interior door handle Hoppe model Verona series on round rose. Beautiful door handle produced by Hoppe. Made of brass with stiff return springs. Compact design, with round rosettes and escutcheons. The finishes branded Resista (R-F41, F77-R, F49-R) are protected for 10 years from wear and tear, dirt and weather. Install Verona model is simple with the help of the quick-fit connection already implemented. Just a simple screwdriver and a few minutes for the mass in work. Each pair will be shipped complete with accessories and mounting kits. Available only with cylinder hole.